Derby-based New Media solution provider Fish Media has landed its biggest and most prestigious contract yet since establishing the business earlier this year. Ebiquita – the UK’s number one independent consumer marketing and data suppression screening company, has appointed Fish Media to redevelop its website. Established in January 2003 by joint managing directors Richard Mackney (32) and Colin Mitchell (26), Fish Media was charged with restructuring the information on Ebiquita’s existing website and also giving it a fresh new design. The website’s re-design is a result of Ebiquita’s growth following the re-brand of the business in August last year. Changes to the website include the addition of a client area to allow Ebiquita’s customers to access the range of web-based data enhancement tools offered by the company, as well as provide online support for these. Fish Media has also incorporated a bespoke Content Management System on the website, which allows non-technical administrators to update the information directly themselves. Importantly, the Content Management System means that Ebiquita’s in-house marketing department can now keep the website’s visitors and users up-to-date with the company’s news and developments as soon as they happen. The challenge from Ebiquita was to design a website that is both visually appealing and provided information clearly to the various audiences Ebiquita caters for. To achieve this we focussed the design around the end user benefits of Ebiquita’s services and employed strong imagery, structured navigation and colour coding to direct users to the information they required easily”. Andy Taylor, Commercial and Marketing Director of Ebiquita, is very happy with the new website. Fish Media specialises in providing New Media solutions to help clients discover, create and implement business solutions by leveraging digital technologies across all electronic media. From transactional website strategies through to online marketing, Fish Media provides clients with opportunities to expand communications, build awareness, streamline processes and maximise competitive advantage. 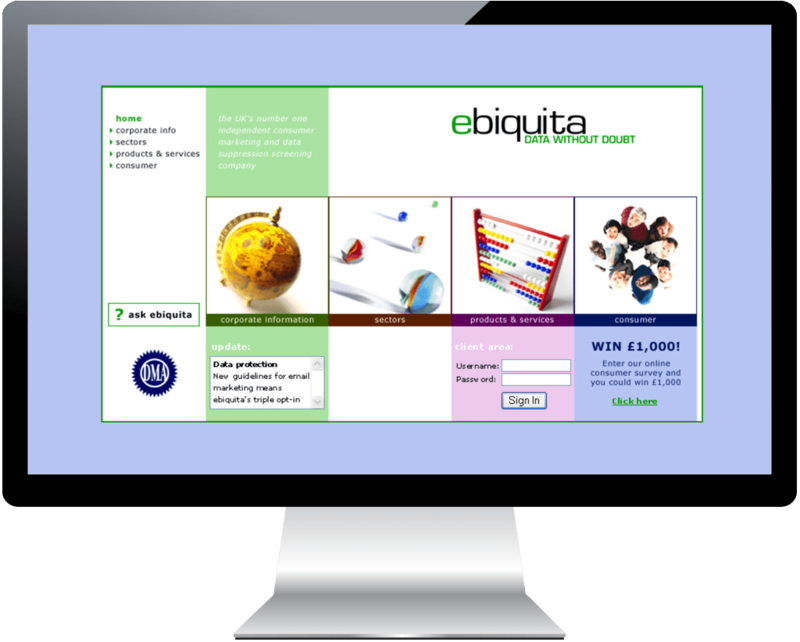 In August 2002, Marketphone re-branded as Ebiquita to reflect the greater range of services and its position as the UK’s leading consumer marketing and suppression screening company. Ebiquita has grown by more than 108% in the last year alone and now has contracts to cleanse, manage and supply data for around 400 of the country’s leading companies.